Home » Events » Open House! Celebrating Completion of the Land Acquisition! 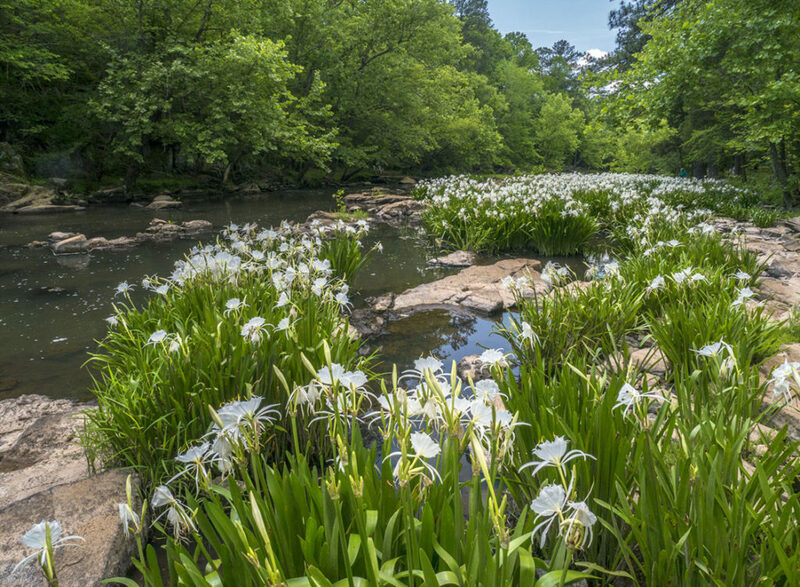 The SC Native Plant Society was able to acquire and protect the last of the land fronting on Stevens Creek at Park’s Mill, where a magnificent population of Rocky Shoals Spider Lily resides. This purchase completes the protection of this wonderful site. To see and appreciate what we are celebrating, go to https://scnps.org/activities/rocky-shoals-spider-lily-preservation-project. We’re sure that you will see why we are in such a jubilant mood. On Saturday, May 18th, 2019 we will hold an open house and celebration at the Parks Mill site. The lilies will be at peak bloom on that date. We hope that SC Native Plant Society members and guests from all over South Carolina will join us on that day. We will be open from 10:00 am till 3:00 pm. Walking tours of the Site, including the newly acquired acreage, will be available during the morning and afternoon hours, with a break for lunch. There will be catered South Carolina barbecue available on site from 12:00 til 1:00. The Park’s Mill site is located about 3.5 miles east of Plum Branch, SC, where SC Hwy 283 crosses Stevens Creek. Plum Branch is located about 5 miles south of McCormick on SC Hwy 28. There is limited parking on the Park’s Mill site, so there will be a shuttle running back and forth to downtown Plum Branch from the Mill site. If you would like to participate, you can come for the morning period or the afternoon period, but plan to be there at noon for the barbecue, and I understand there is fine BBQ to be had in that area. We will be selecting the best catered barbecue for lunch.